Take Off, the debut project of director Mahesh Narayanan, is a well-made movie tightly packed with deep and genuine emotions. It is the movie’s emotional intensity that defeats Akshay Kumar starrer Airlift which dealt with almost the same theme. Take off has in it all the ingredients in the perfect proportion. 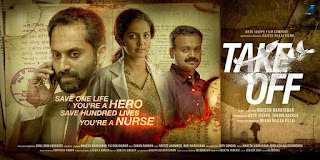 The plot is based on the evacuation of Malayalee nurses from Iraq in 2014. It is a thriller and an intense family drama at the same time. The vital force behind the compactness of the storytelling in the movie is the fact that the debutant director is an acclaimed editor too. He knows his stuff, i.e., where to cut, where to paste and what to throw away. Parvathy stole the show with her genuine and intense performance! Not any actress in the present day Malayalam film industry can perfectly replace her for this role. Though a whole lot of other characters, including the much sought-after Fahadh Faasil and Kunchacko Boban, are there in the movie, she is the one who leads the movie.Technical and artistic brilliance is the key factor that helped the movie in its smooth take off. Gopi Sundar's background score reminds us of the Vangelis' world famous 'Conquest of Paradise' theme. The over dramatic rescue of Kunchacko Boban's character from an IS camp is a bit filmy and will drive home to our mind the climax scene of Mani Ratnam's Roja. Those minor distractions aside, Take Off will certainly give you the feeling that Malayalam movies can handle such serious plots effectively and convincingly. Yes, you are absolutely right. This is a milestone in Malayalam film industry. Hats off.